I bought this book because my 7-year-old has learned to say hi to Jesus when he passes by a church (thanks to grandma). He stopped believing in Mother Nature and I wanted to nip religious fanaticism in the bud. This book worked! It is beautifully illustrated, interesting, and full of cool facts. It furthered our discussions about creation vs. evolution and since my son is a lover of dinosaurs, he is on his way to scientific allegiance. I highly reccommend it to any parent who wants to teach children about the history of the earth and to unteach insipid mythology. *Although I must warn, it has quite a bit of writing and big words for young children. Grandma has oodles more wisdom than you think. Jesus loves you regardless. When I was a kid I thought evolution was a joke. I couldn't believe that scientists (I know now that a lot disagree with neo-darwinism) would believe all life came from the same ancestor. It was obvious to me that that is not happening in the real world. Though i was taught evolution at school in a French public school. I am now more than ever convinced that God created the first species ,a d the first 2 humans, and the first seeds. Anyway, I hope your kid gets to think for himself, and search the real truth not the mouth-fed "truth". I'll never understand why people feel the need to inject their "insight" into areas that obviously aren't for them. Why are you even reading reviews of this book if it so vastly goes agaisnt what you believe? To Ades, your review helped me choose between several books to purchase to battle the same issue of the Super Deity being put upon my young child by outside forces. To each their own. If we lived by that, wouldn't the world be a much better place? How on earth you do think you learned about creationism? Deductive reasoning taught in Sunday school? Good for you, Ades. 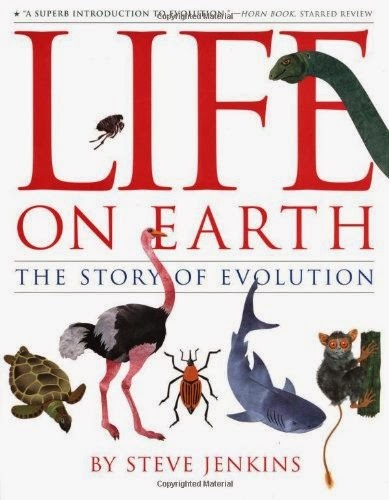 I have done my best to shield my children from the influence of religion, and I think this is the perfect book to help show them how life came to be on this planet. Every scientist knows that the measurement of the passing of time varies. Ex. ; time passing much, MUCH faster or slower at the event horizon of a black hole than it does on earth. While a million years pass on this earth, a few hours might pass near a black hole. Well.... Genesis is measuring time passing AT THE BEGINNING of the Big Bang-- from the BEGINNING OF THE CREATION OF MATTER. Time passed a million million times faster then than it does on this earth. Check this :: 16 billion years on this earth, it turns out EQUALS TO . . . . . . . . . . . . . . . EXACTLY at the Big Bang SIX DAYS. !!!!!!!!!!!! I guess you notice that this is undeniable scientific math too. And I name sources. "Unteach insipid mythology"???? This is where (six days) ignorant people think the Bible is most mythology!! The supposed error in Genesis time periods. WELL??? You're all snippey and rhetorical about "deductive reasoning taught in Sunday school?" ??? Oh how atheists just don't get it. What I've shown here is objective fact. Let's hear your specific sources to back up the expressions YOU speak, atheists and agnostics. Source: Dr. Gerald Schroeder 1/3 through "The Science of God". Thanks for the space; I'm SO sick and tired of atheists considering it more of a possibility that there are trillions of trillions of universe than there is a Creator. Absolutely outrageous. Anyone not follow that??? Totally recommended reading of objective facts: Dr. Gerald Schroeder's "The Science of God". Time passed a million million times faster at the moment of the creation of matter; than it does here on earth. 16 billion earth years = exactly 6 days at the creation of matter. The passing of time was measured in Genesis from the moment of creation of matter. From God's perspective, and the Bible is all about God. a reference frame that embraces the entire universe and retains that universal perspective...." Genesis chooses the right reference frame. From the creation of matter. Now you tell me that God didn't write the Bible merely through men !!! God, the Creator of this universe . . . .
but between moments of the universe as it evolved from the big bang." "Genesis is measuring time passing AT THE BEGINNING of the Big Bang-- from the BEGINNING OF THE CREATION OF MATTER." How fun to watch you use science to back your fairy tale book! Isn't science great?....when you cherry pick it? "What I've shown here is objective fact." Scientists aren't even SURE yet that there even WAS a big bang. It's the foremost of several theories being looked at and tested. Science does that, you know...TEST things. Does your religion TEST THING? Hmm? What if next year new evidence shows the big bang is incorrect? Where does that leave YOU? "When I was a kid I thought evolution was a joke. I couldn't believe that scientists (I know now that a lot disagree with neo-darwinism) would believe all life came from the same ancestor." "I am now more than ever convinced that God created the first species ,a d the first 2 humans"
So, you can't agree with science that the first life came from common ancestors that grew and changed, but you CAN believe it came from TWO God-created-out-of-dirt ancestors? Huh?